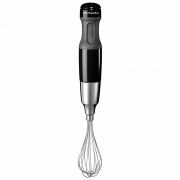 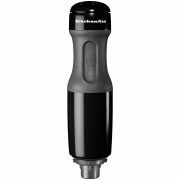 5KHB2571BOB Combining striking design and the best technology available, this KitchenAid hand blender provides exceptional control and long lasting operation for all of your blending needs. 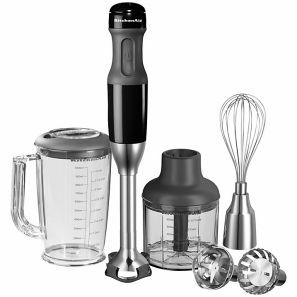 With 1-5 speed settings (6100-11000rpm) and a powerful motor, all of your ingredients will be blended to perfection in seconds. 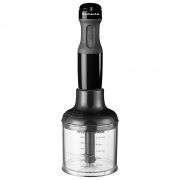 3 interchangeable stainless steel bell blades allow you to easily change between blades for a multitude of tasks. 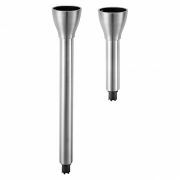 2 stainless steel removable blending arms are on hand to reach deeper into large pots, bowls or pitchers. 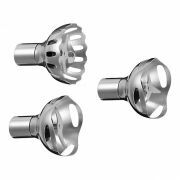 A removable pan guard prevents scratching on your cookware, minimising damage. 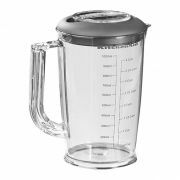 A 1L graduated blending pitcher with no splash lid is ideal for blending soups and sauces. 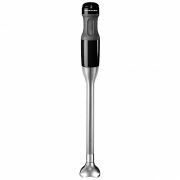 Chopper and whisk attachments are also included to provide an all round excellent performing hand blender. A convenient storage case makes tidying away a breeze. Accessories: S-blade, star blade, frothing blade, 2 blending arms (20 and 33cm), 1 pan guard, 3 bell guard, graduated 1 L pitcher, chopper, whisk, storage case.